Although you are not able to camp on the beaches of Nantucket Island, there are many great accommodations on the island and nearby in Martha's Vineyard and Cape Cod. According to Nantucket Online, "in order to protect the island's fragile environment, camping (including just spending the night on the beach in your sleeping bag) is prohibited and punishable by a fine of up to $200." There is camping in Martha's Vineyard, though, at the Family Campground. Even though there is no camping allowed on Nantucket, there is still plenty to do and see there. If you are planning a trip, be sure to check out the top sights including Monomoy Charter's Critter Cruise, the First Congregational Church, Nantucket's Old Mill, Nantucket Whaling Museum, and the Nantucket Shipwreck & Lifesaving Museum. If you love the outdoors, there are also plenty of beaches for relaxing, exploring, and enjoying the water in the summer. Additionally, you can visit the island's three lighthouses or take part in cultural traditions on the cobblestone streets of the island's historic town. 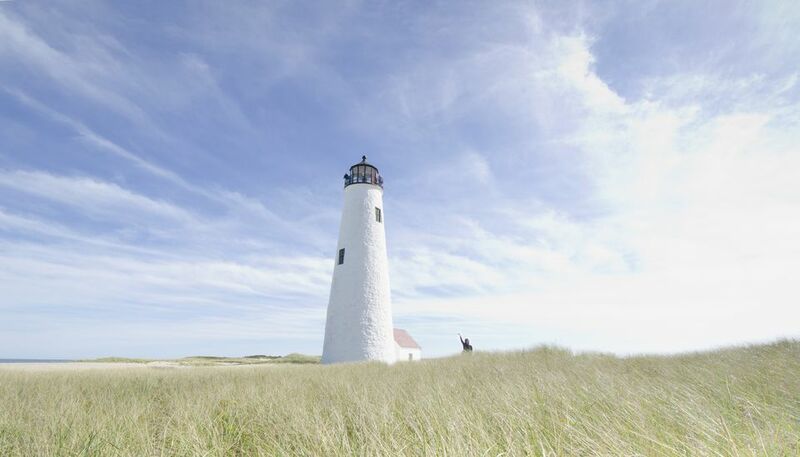 If you're looking for a great day trip from Cape Cod, Nantucket Island is just 26 miles off the coast of Massachusetts and offers plenty of great activities throughout the year—though spring and summer are the most popular times for tourists to visit. From Coatue beach on the northeastern shore to Madaket Beach on the western tip, Nantucket beaches are among the best and most popular destinations in the northeastern United States. You won't find many waves on the north shore as it's protected by the Nantucket Sound, but the south shore beaches have large waves and strong currents. However, strong northern winds sometimes cause these conditions to reverse, so be sure to check the prevailing winds before choosing which beach you'll visit. Another great way to spend the day on the island is to visit Nantucket's three lighthouses. The most popular is on Brant Point, which is seen when arriving by ferry to the island, and it's a tradition to throw a penny in the water when leaving to ensure a return visit. While you may not be able to legally camp on the beach on Nantucket Island, there are a few places in the town of Nantucket where you can spend the night so you can make the most of daylight hours at the beaches or lighthouses. The Harborview Nantucket is one of the most popular accommodations on the island, offering a unique opportunity to stay in one of 11 cottages at a resort-style facility. These cottages resemble typical fishermen cottages on the outside but feature modern and light interiors with full kitchens and top-of-the-line appliances and amenities. There are a number of other resorts and hotels, many of which are inside historical buildings, including the Jared Coffin House, the Wauwinet, the Seven Sea Street Inn, the Beachside at Nantucket, and the Century House. Alternatively, you could hop on a ferry and head back toward mainland Massachusetts to Martha's Vineyard, which not only features a number of great resorts and luxury hotels but also has a family campground where you can pitch a tent and sleep under the stars.